Twilight is not for sale. She's mine. Another soldier enlisted in my plushy army! She's made from minky with machine embroidered details. Her head is secured with a lock nut joint so it can rotate. I'm glad I finally finished her! She'd been just sitting off in her own little corner for a while. Not for sale? Damn it! 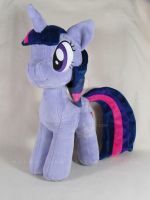 Every time I see a great looking Twilight plush, I feel like it's calling out to me saying "Please hug me". how much wld summin like this be? She is flawless and absolutley adorable, great work ! wow she looks amazing do you do remakes for people id love one! I would bet that there's no better Twily figurine than this one. OMG you rock at this!! Love the idea of a moving head! She looks amazing! how do you do the eyes? The locknut is the one furthest to the right. The others are cotter pins. No problem! I'm going to do a livestream on how to joint a plush pretty soon. Hopefully this coming weekend. Awesome. Too bad she's not for sale. Oh my she's a beautiful shape! I like the idea of a rotating head. Squee! 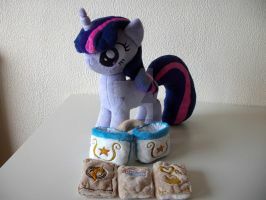 I just recently made up my mind to try making a Twilight Sparkle plushy (just bought the fleece today, in fact) and this is very close to how I envision mine looking (sadly, I don't have an embroidery machine, tho, so I'll have to figure out a different method for the eyes and cutie mark). Anyway, beautifully done, and very professional-looking. Ill be extra sure to annihilate that trixie auction now, she would be most pleased to be far away from twilight, plotting her revenge. 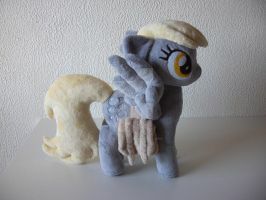 i've seen people attempt to make ponies into plushies and by far, yours are really good. like they look like the charachters and all. DAAAWWWW SO CUTEEEEEEE. A shame I can't make nor afford these; that is, if it was for sale. No, I don't give out my pattern but there are some good ones here on dA. Aww! She came out so adorable! Thanks so much! I seriously love that Twilight you made. I swear you make some of the best looking pony plushes I've seen. Hehe thanks! I've been really trying to improve, I'm glad it's paying off! I'm still really impressed with your idea to make them jointed. its better then i expected!!!!! Thanks! It's actually not that hard. There are a few tutorials online. Thanks! I put some batting in it instead of stuffing. It's so soft and floppy.